As the MOTUL FIM Superbike World Championship circus heads to The Netherlands for the MOTUL Dutch Round, fans are preparing for an exciting weekend full of exciting activity and a chance to meet the local heroes. 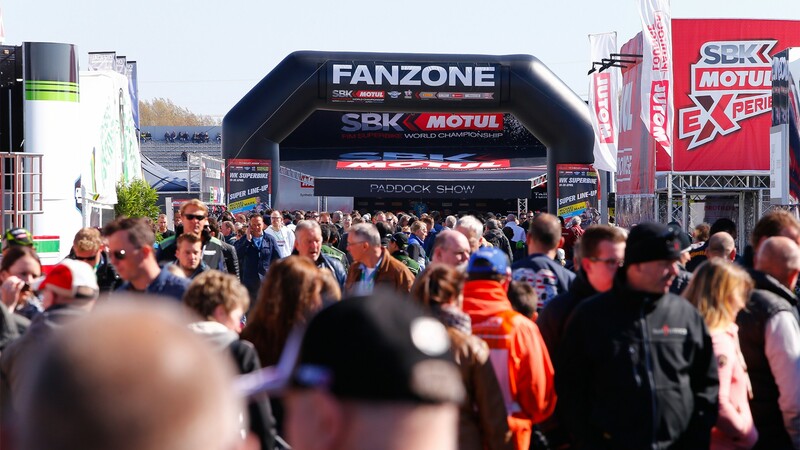 Guaranteeing all Dutch riders will be on stage at some point throughout the weekend, the world famous Paddock Show welcomes a bigger and better fan experience throughout Europe. With the usual live coverage throughout the weekend, it will now welcome fans for the opportunity to get closer to Parc Ferme, as bike will roll into there directly from the track and next to the Paddock Show stage. Alongside the new podium and Podium Shows, it won’t be an opportunity to miss. On top of this, the SuperShow will once again be offering the best entertainment for fans once the bikes are off the track on Saturday from 15.45h. Don’t miss out on experiencing the Fan Zone, which will offer a SHAD and Acerbis product displays and photoshooting. Enjoy chilling out for the weekend with Prosecco Doc distribution as you wander round and pick out some merchandise to support your heroes out on track – especially home hero Michael van der Mark (Pata Yamaha Official WorldSBK Team). On top of this, the fan zone will offer a kids mini bikes track, MOTUL and Milwaukee animation. Get the opportunity to see how the WorldSBK pit lane works, with the free pit walk on Saturday from 15.40 and Sunday from 10.25. Free with your weekend ticket, you can get the chance to see the riders up close and personal, as well as an exclusive glimpse into the working pit lane. Offering free parking and a helmet guard service for the weekend, fans will be in for a fantastic MOTUL Dutch WorldSBK.